Philadelphus coronarius ‘Aureus’, a member of the Hydrangeaceae family, can be found on the Azalea Walk. You’re most likely to smell this large shrub before you see it. 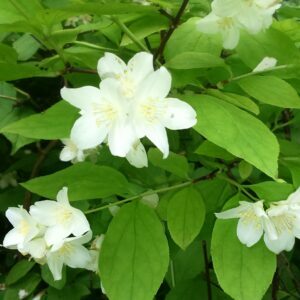 Philadelphus in general have a marvellous scent and this variety is particularly fine – the scent being a cross between lemon and jasmine and very strong on a warm sunny day. Philadelphus coronarius ‘Aureus’ has bright yellow leaves, which gradually darken as they grow older. It is a strong, sturdy, medium-sized shrub (up to 2.5m high and across) with white single flowers. It is fully hardy in England but the young yellow leaves may scorch in full sun and it prefers a dry soil, making it perfect for the top of a bank and beneath the trees. If you need to prune it to keep it within its space, be sure to do so after flowering.